The patented Parabolic Transducer Array in the K 270 S has two optimized transducers in each earcup, both precisely configured in a tuned enclosure to focus sound waves at the entrance to the ear. The result is a dramatically increased perception of spaciousness, extremely accurate response, and no audible distortion at output levels far beyond the capability of single transducer headphones. I have owned a pair of K270 for several years now and i have always appreciated the neutral sound and the absolute lack of distortion. The K270 needs a powerful amplifier. About the Bass. If there a lack of bass in the K270, the record contains no bass. But don't purchase any Hi-Fi equipment unless you have tried it for a period and like it personally. The sound is clear, no strong bass, no strong high just extremly neutral. I'm owning the AKG K270 since 18 years and I didn't really care about them - they still look like new even I use them every day. One of my best parts I've bought. I have a AKG K270 Studio and I like it very much. I really love good sounding audio. No extra bass or high tones in it. I am a musician and play piano, keyboard, synth. I need a headphone like this in my home-studio! Out from the box, this earphones is the clearest, neutral, most detailed set i've ever owned. I have Mission 783 speakers and an all-Arcam set-up and listening to this baby was as enjoyable to listening to my speakers. I plugged it directly to my Arcam AVR100 headphone output and man was I in heaven! If you love honest presentations of recordings and looking for a honest-sounding headphone, the search is over. i can asure that people dislike this headphones are just ordinary listener who expect boom bass and think that boom bass is awesome... =) the 270S is very-very honest sounding, its true that its a bit 'bass shy' becouse of the "flat" factor- but thats why its very accurate and help you judge the mixing process besides the monitor... i definately think that if you buy the 270s for listening you might wont like it or might be dissaponted ( but i love it becouse of the 'honest' factor-- too bad the badly recorded CD would sounds more awefull in this), but if you do sound enginering, tracking and use it in studio environtment this one a true champion =) i even considering to get another same pair since i love it so much and its been dicontinued and replaced by the 271 which dont have the dual driver in each ear cup. if you're a bass maniac this product will dissapoint you.. you dont haer bass... you feel bass!!!! 'careful with your judge... btw, this headphones need long burn in period... but its worthed since the sounds even more tranparent after the burn in. I bought the AKG 270 S based on a recommendation from a friend. Then I read a negative review about them on the internet. I don't think that negative review is justified. These headphones may be somewhat weak in the bass, but they sound very accurate and very open in the mid and high ranges. I like the automatic switch feature that turns off the sound when you take the phones off your head. I've worn them for hours, and they feel light and comfortable. They can really output deafening sound volume, very nicely, if you were so inclined to do so. That info's not for listening, but as an investment protection, in case you accidentally turn un-mute your system when the volume is way up high. These headphones are closed-design, and they do a good job of excluding surrounding noise... which I appreciate. I was looking for accurate monitoring headphones for daw use. On that area these are great (maybe best?) headphones for the money. The design is very professional: two (!) transducers per ear and specially shaped earpads so that signal is focused on ear entrance. The sound is VERY detailed, also doesn't add anything to the original sound so everything comes out as intended. I don't consider my sennheiser HD 25-1 as monitors anymore allthough they sell them as a studio monitor (works for DJs maybe but for accurate mixing/monitoring, no thanks). I can simply hear things that sennheisers didn't reveal and they even cost more than these cans! I wouldn't buy these headphones for casual listening purposes, however. That's what hifi products are for. Allthough with good material these never fail to satisfy, but don't even try those badly recorded commercial recordings, you'll just get disappointed. I own already a pair of Sennheiser HD25-1 and tried also akg 240 & sennheiser hd500-600 series. Open "natural" airy sound. Can listen for hours without developing ear fatique. For recording engineers, they might not have as accurate and flat freq. response as the K240DF, but hey ... at the end of the day it''s about the listening pleasure. I did not actually purchase the K270S model. I acquired a set of K280''s back in 1992. They were the forerunner to the K270S model. I had auditioned just about everything in the AKG, Sennheiser and Beyer-Dynamic lines. The K240DF and K240M sets had a very closed (something is on my head) sound in comparison to the K280''s. They K240DF may have flatter frequency response; and both are cheaper, but by my listening criteria the K280''s were far beyond the 240 series in realized listening pleasure. The Sennheiser and Beyer-Dynamic products I found to be unimpressive. They just didn''t jump out at me and say, I''m the best headphone product you can buy with your hard earned cash for $300 or less. I returned a pair of Sony MDR-V600''s to pursue AKG''s product line. The Sony''s gave you a bad case of cauliflower ear after about 45 minutes of listening. 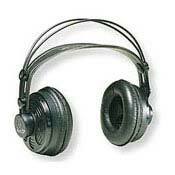 I can''t imagine any pair of single driver headphones beating these for general listening purposes. Do yourself a favor; and at the very least, compare these with the other contenders for your headphone budget via A-B listening tests. I don''t think you''ll be disappointed! AKG K240DF, K240M, various Sennheiser and Beyer-Dynamic products. Sony MDR-V600.